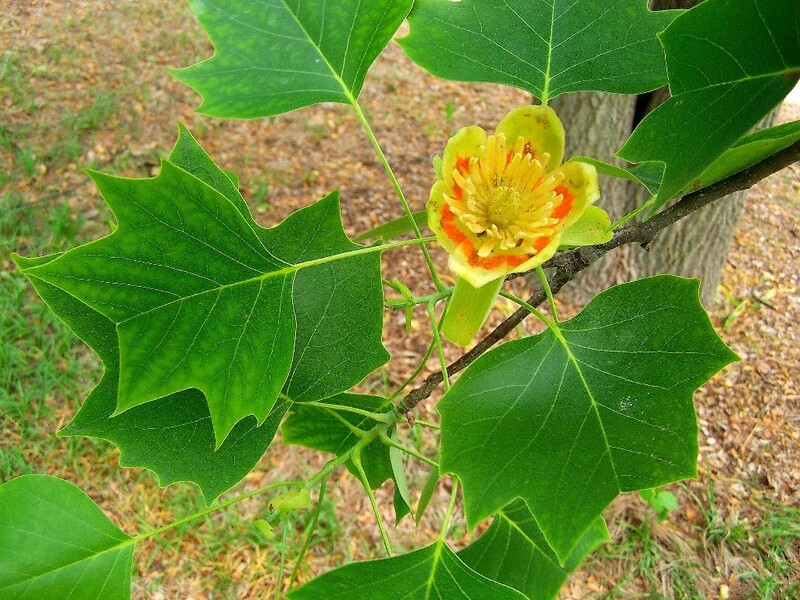 Liriodendron tulipifera is a tree to 60 m tall; may live about 200 years; taproot and lateral roots; trunk columnar, bark gray, older bark shallowly fissured, grooves often whitish, twigs with white lenticels, nodes encircled by stipule scars (Harlow 1946; Petrides 1988); roots associated with arbuscular mycorrhizal fungi (Decker and Boerner 1997); fine root architecture is thick and short, more like that of some Gymnosperms rather than the fine roots of woody angiosperms (Pregitzer et al. 2002); winter buds dark gray, flattened, 2-scaled, leaf scars almost round with numerous vein scars (Harlow 1946; Petrides 1988); fast growing, growth pattern indeterminate under favorable conditions (Gargiullo personal observation). Leaves alternate, lobed, tulip-shaped 8-14 cm long about as wide; leaves expand early-mid May; winter plant leafless 160 days (Britton 1874). Flowers large, solitary, tulip-shaped, pale green with orange base, about 4 cm wide with 6 petals, 3 sepals, curled back, May-June; insect pollinated (flies, beetles & bees) but also self pollinated. Bees make honey from nectar. Liriodendron tulipifera.fruits (samaras) and floral remnant.ro.wikipedia.org (Accessed 2/2016). 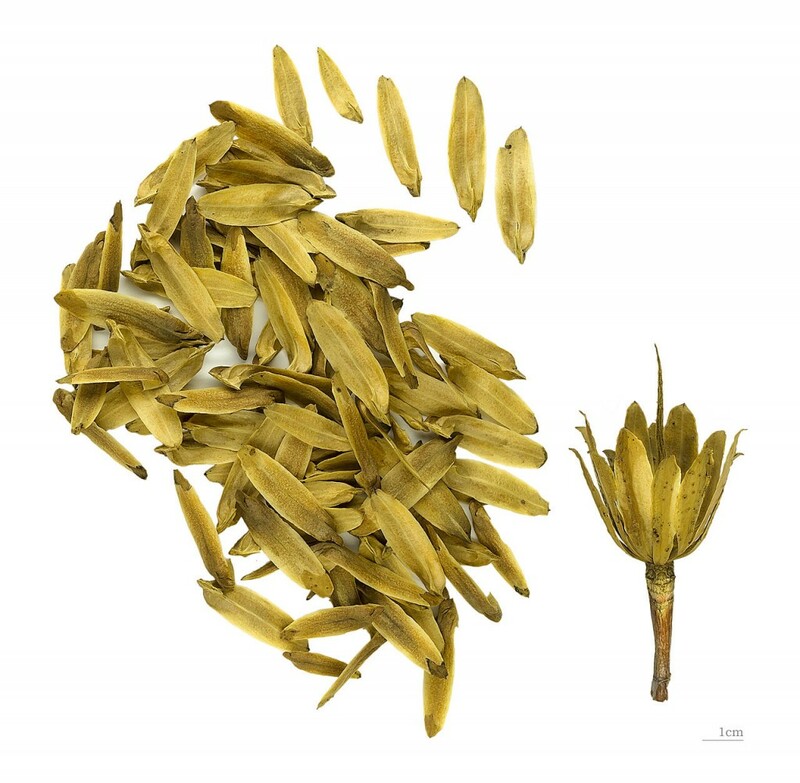 Fruit a narrow cone-like aggregate of winged seeds, about 3 cm long, Sept.; seeds wind dispersed, Oct.-winter, to about 100 m away from parent. Seed must overwinter to germinate, viable 4-7 years on forest floor, need some disturbance to germinate (fire, bare soil). Seedlings tolerant of partial shade (3-10% full sun), (Hicks and Chabot 1985). Seeds eaten by birds, squirrels, and mice (Martin et al. 1951). Habitat: Uplands, rich soil, moist, well drained, loose soils, pH 3.8-6.5 (USDA, NRCS 2010; Greller et al. 1990; Hightshoe 1988; Gargiullo unpublished data). Intolerant of salt, flooding, (except during winter), drought, soil compaction, shade (P50 of 900 foot candles), (Bazzaz et al. 1972), but listed as intermediate, index 4-6, by Hightshoe (1988). 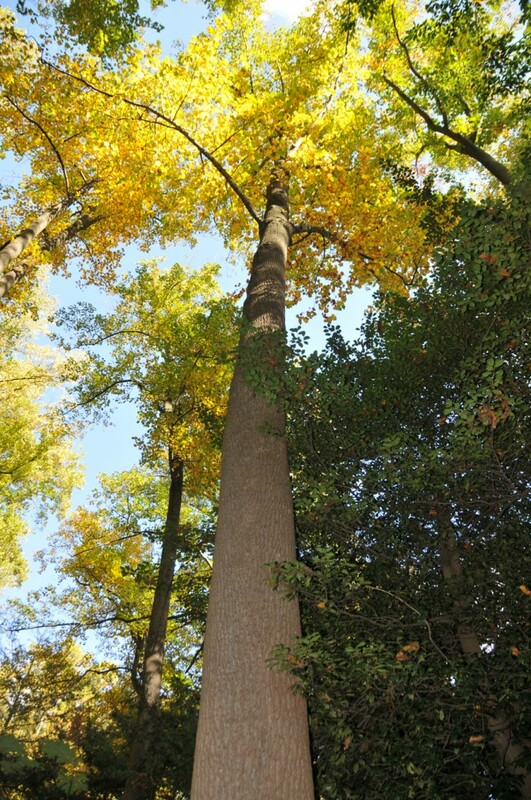 Liriodendron tulipifera.Mt. Cuba Center-www.mtcubacenter.org (Accessed 6/2015). Notes: Twigs eaten by deer. Rabbits eat seedling bark and buds (Martin et al. 1951). Often a pioneer in undisturbed old-fields. Trees stump or root sprout if cut or burned. Grows rapidly, overtopping competing vegetation, but cannot use more than 30% full sun (saturation point) (Hicks and Chabot 1985). Attacked by tulip tree scale (Toumeyella liriodendri), yellow-poplar weevil (Odontopus calceatus), root-collar borer (Euzophera ostricolorella), and other insects including larvae of the tiger swallowtail butterfly (Lepidoptera) Papilio glaucus (Tallamy 2003). Fungal infections may enter damaged trees. Thin bark of young trees very susceptible to fire damage and are easily overrun by vines (Burns and Honkala 1990; Sinclair et al. 1987).